Dogs are built to eat poultry, fish, whole meat, and other wholesome ingredients. It’s their instinct to roam the wild and hunt for food, after all! Nature’s Variety wanted to give dogs a type of dog food that closely resembled their natural diet with the right balance of protein and vitamins, so they created a brand of dry, wet, and raw dog food called Instinct. Today, Instinct remains arguably one of the best dog food brands on the market. Not only that, but it’s also one of the leaders in the raw dog food market. Nature’s Variety owns and manufactures Instinct dog food. Nature’s Variety is a small privately-owned company based in St. Louis with manufacturing plants in Lincoln, Nebraska. (February 2013), a batch of Instinct Raw Organic Chicken Formula was recalled because pieces of plastic were found in the food. In 2012, two formulas of dog kibble were found to have expired sooner than expected, so Nature’s Variety issued a voluntary recall. In 2010, the frozen chicken formula in the raw frozen diet product line was recalled because of a possible Salmonella contamination. Instinct is a 100% grain-free and gluten-free pet food brand. That fact alone has them scoring major brownie points with us. Not only that, but they also offer raw dog food, even in freeze-dried form. Instinct dog food is marketed as “100% free of corn, soy, chemicals, wheat, allergens, and artificial colors & preservatives”. After analyzing the ingredients in Instinct dog food, we’ve found their claims to be completely true. That’s an odd combination, but they have a good reason for making those the top five ingredients. For starters, chicken meal is an excellent source of protein. It provides 300% more proteins and nutrients than raw chicken does. Tapioca is a starch normally used in higher-end dog food. It’s gluten-free, non-GMO, and perfectly safe to eat. The reason for adding tapioca to dog food is to bind the kibble together. Chicken fat sounds gross, but it’s actually a quality ingredient. It’s an excellent source of linoleic acid, an Omega-6 fatty acid. Right now, you’re probably wondering, “why on earth would anyone put pumpkin seeds in dog food?” Well, Instinct has a good reason, and it’s because pumpkin seeds are chock full of essential fatty acids for dogs. Also, they serve as a natural remedy for worms, benign prostatic hyperplasia, urinary tract problems, and kidney stones. Menhaden is a type of fish, which provides a good amount of Omega-3 fatty acids and protein. Some of the ingredients farther down the list include protein sources like freeze dried turkey, chicken eggs, and salmon and vitamin sources like carrots, apples, and butternut squash. Each ingredient found in Instinct dog food is wholesome and nutritious. It’s clear that Nature’s Variety values the quality of their ingredients. All in all, we highly recommend dry, wet, and raw Instinct dog food for dogs of all life stages. Some Instinct dog food formulas include both high-protein kibble and freeze-dried raw meat. This combination provides a good balance of protein and other nutrients. The Instinct Raw Boost product line has a variety of meats, including Instinct Raw Boost Chicken Meal Formula. This formula boasts 74% pure animal ingredients and nutritional oils, 26% vegetables, fruits, and other wholesome ingredients, and 0% grain or gluten. According to Instinct’s website, the kibble “provides grain-free and nutrient dense nutrition” and the freeze dried raw pieces “provide pure nutrition for digestive health”. With the first five ingredients being chicken meal, chicken, chicken fat, chicken eggs, and chickpeas, you can easily figure out that this formula is chock full of protein and iron. In fact, the crude protein content is 38% (and the crude fat is at 20.5%). It’s an excellent formula to feed healthy high-energy dogs and lazy overweight dogs alike. Where can you buy Instinct? According to Instinct’s website, they proudly partner with pet specialty stores and veterinarians. You can use the store locator on their website to find the nearest pet store that carries Instinct dog food. Is Blue Buffalo a Good Dog Food? Changes in product over the last year have made this food and it’s company unacceptable. Food with expired dates, products which smell like rotten fish and food which has been thawed and then refrozen has been seen in many local stores. Granted, it could be the supplier, but the company as a whole refuses to do anything about this. Anna is correct. I quit feeding my dog this food (after enthusastically recommending it for almost 10 years!). The only way I could try to determine the formula change was to find an older bag and check it against the new label. The company finallly put that info (buried but it’s there) on their website. However, they won’t explain the reason for the change in the product. It says something like “more tasty” – not according to my dogs. 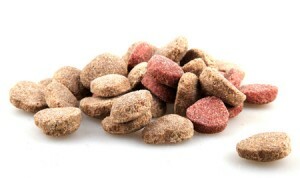 One of my dogs had a tendency toward bladder stones, so rabbit grainfree made a huge difference. My other dog would eat garbage and have no ill effects. However, with the new formula, both dogs had severe gastric upset, gas that was so toxic we had to leave the windows open. I had gradually switched them from the old to the new, even though one selling point of Instinct is that you can mix different Instincts w/o worrying about transition – a coating on the food was supposed to avoid that. I contacted the company, posted on their site, etc. asking for specifics on the changes and got no response. I can only assume that the change was made for cost savings. In doing the research on the change, it also seems that the constant shortage of Instinct rabbit dry food was not due to “the rabbits are from New Zealand there is a shortage”, but rather that they only do production runs of each variety several times a year, so if they miscalculate demand, there will be none produced until the next scheduled run. I cannot verify this since they did not respond to me, but it appears from several sources that this is probably true. I also read, (and hope it is incorrect), that the rabbit is not from New Zealand but could have been from China. Again, I cannot confirm this. It’s enough red flags to have me switch. The shame of it is that I was willing to pay premium prices for this food, travel to 20 stores if necessary to find it when it was in short supply, and give them every opportunity to respond. It’s been probably a year since the product change and appears that there are still quality issues. I’ve noticed a change in my King Charles’ eagerness to eat her food over the past few months. She’s only been fed Instinct since 5mo old when I rescued her. I’ve also noticed she’s developed more of a gassiness/burps and her breath has been more noticeably foul. I’ve read about the change in formula, but have too been unable to officially verify the changes with the company. I would like to switch foods, but would like to know what you chose to feed your pups after discontinuing Instinct? Can you make any recommendations other than Taste of The Wild which has serious recall issues? I’d appreciate any advice. Thanks! I have 4 shihtzus and a 11 old month cat and have all of them on Instinct (chicken dry) and they love the food and have no issues. Would not feed this food. Started feeding this food in 2006 and shortly after found blue plastic in the food. Called customer service and emailed a photo of the plastic next to a dime for reference. They didn’t do anything about it. Didn’t even replace the product I had to throw away or refund or replace the unopened food. I stopped this food immediately – didn’t trust it as the plastic was in all of the food and I never heard anything about a recall on that plastic containing food. Within a year was the big melamine pet food poisoning, so after that the vet recommended I switch to home made food. They’ve been on home made since. Big question is why did it take Natures Variety from 2006 to 2013 to recall their products containing plastic?